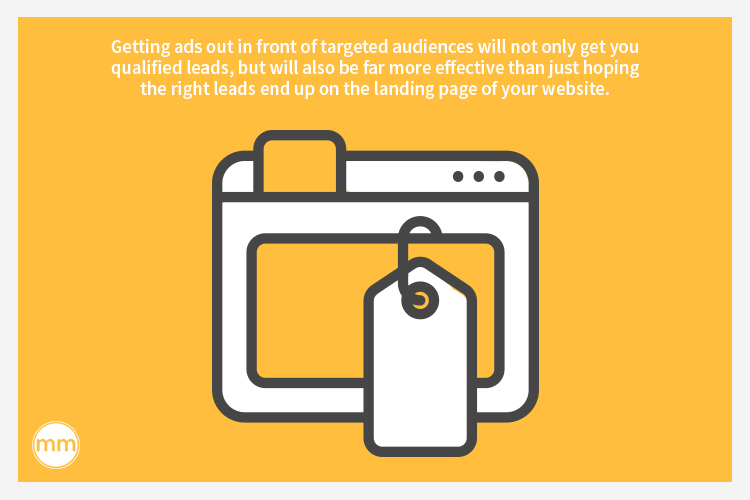 Every business needs leads. Period. 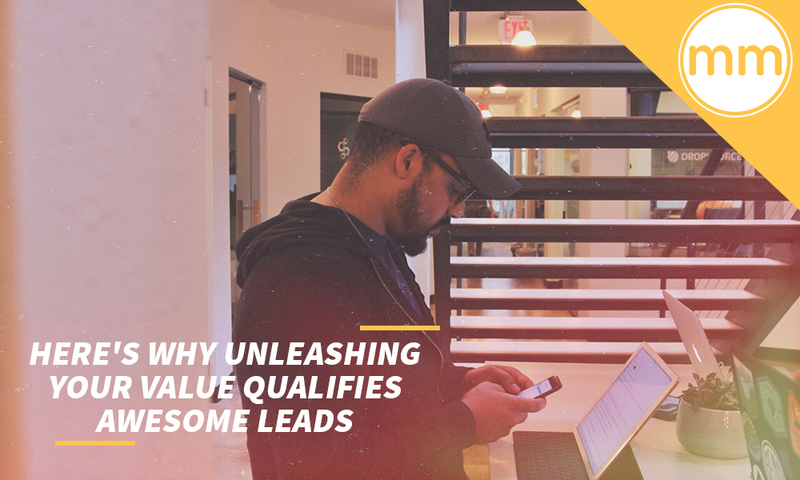 You can’t grow a business without leads, and they have to be qualified leads. If you know me and my business Palizay Media, you know we do marketing differently. Our motto is “value over everything,” and you know why? Because we put all our value out there, no holds barred. We give it all away, and this has led to the success you see today. So how do we do it? 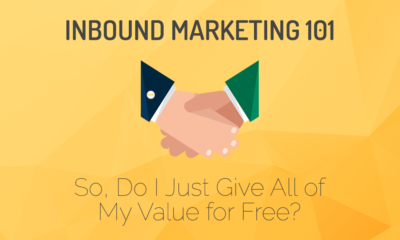 How could giving away your value for free possibly yield leads? And how can you replicate that in your own business? I’m going to break it all down for you. Let’s get it. 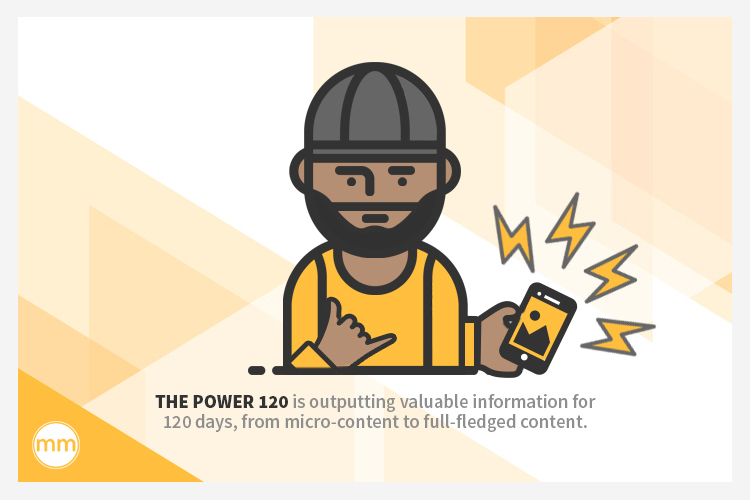 It’s outputting valuable information for 120 days, from micro-content to full-fledged content. I believe that every business, organization, personality, or brand that has value can do this. It’s just a brain dump of all the categorical value you can possibly add to a niche or segment of a market. If you can do this, you immediately put yourself in front of 80% of any other player in that market. Even the major players. As a small business owner, you may think it’s nearly impossible to break through the saturation of your market and have a serious effect on the industry. But it’s really not impossible at all. We’ve seen it time and time again. Smaller players have come in, built cult-like followings and huge communities, then put a dent in the business of those big businesses that have been around for decades. AirBnB has done it in the hospitality industry. Uber has done it in the taxi industry. And the Dollar Shave Club has done it in the razor industry. But back to the power 120. You might be thinking that creating 120 pieces of content sounds undoable, and you’re not the only one. People complain they don’t have time to put out content at that level when they have networking to do, customers to contact, sales to make, growth to manage, and lots of other responsibilities. That’s totally understandable. You have to manage your business development too. But here’s what you’re missing: There are so many inverse effects to writing content, documenting your story, and being a storyteller. 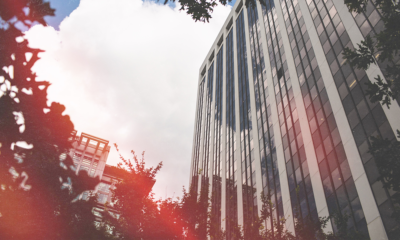 I always say that the best marketers are salesmen, and the best salesmen are storytellers. That’s because I’ve had the most success with sales from telling stories. When you look at the last 15 months in our business, it doesn’t look like we’ve had much in terms of transactions other than the The Modern Marketer club. But when you look under the hood, you see hundreds of thousands of dollars that have come through the Modern Marketer brand into the Palizay Media business. Clients have told me that they literally only hired us because of something they read on The Modern Marketer blog, or a video they saw on the YouTube channel, or because they generated a partnership or got referred a huge client through networking with club members. Relationships have happened because of this brand. And that’s the point. When you’re putting out as much value as you can, you’re going to attract people who will want to connect and bond based on that value. 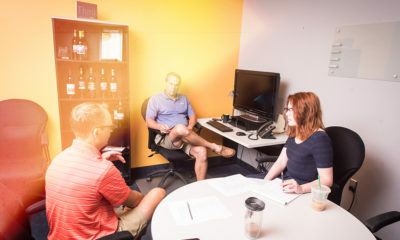 This brain dump over 120 days is really more than just demonstrating your knowledge and expertise, it’s about building a foundation of value to base a community. And a community will yield leads. A community will scale your business. Get it? Every industry is saturated. You need to be creating and distributing content every single day if you’re going to have a sliver of a chance to make a dent in any industry. It doesn’t have to be long-form philosophical blog posts everyday. The same conversations you would have with customers, investors, or partners can be turned into content. The content and value you’re creating is for humans. After all, any opportunity in business has to have a human involved. Every piece of content you make will add value to experience. 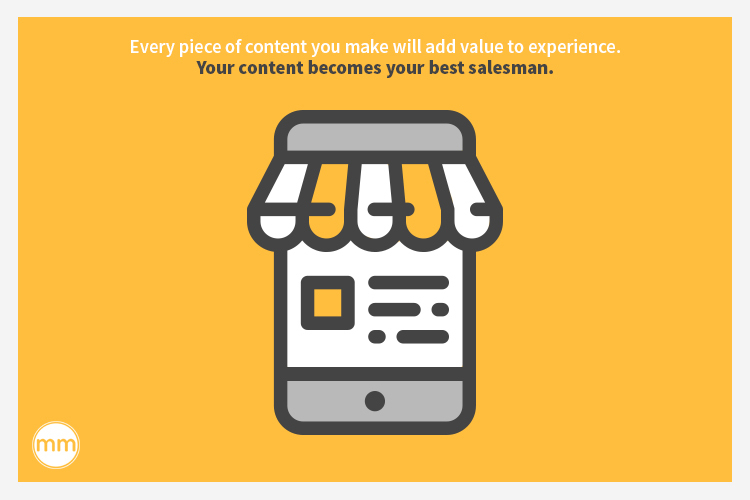 Your content becomes your best salesman. So if you can truly amplify your content, your voice, and your storytelling online, you will be creating the foundation for not just leads and sales, but genuine business growth. The reason I advocate for four months of content creation in the Power 120 rather than 60 days or 90 days is because of all the byproduct benefits that come within that duration of time. 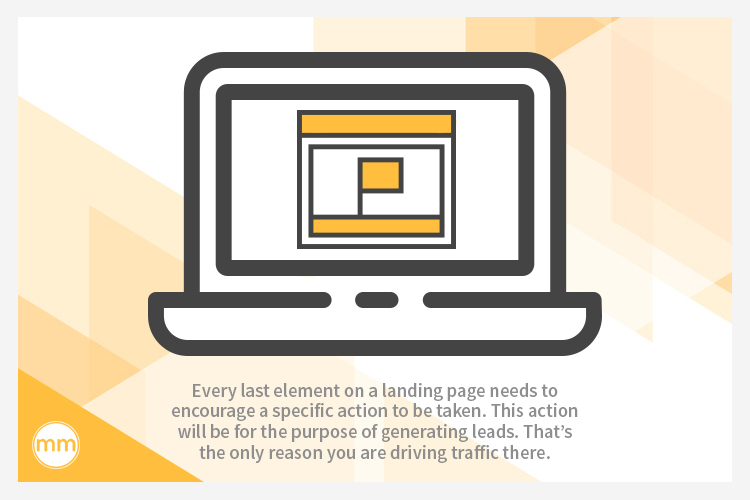 Not only is your SEO compounded over those 120 days, but what you’re quickly creating over that time is a digital asset. That’s an incredibly powerful thing. Think about it this way: you can build an audience, attention, leads, sales. But all of those things are temporary, and you could lose them quicker than you got them in the first place. On the other hand, your digital content is always going to be there, even if you lose everything you built. And that’s the foundation for your business. That’s the base. The bread and butter. And you build off of it again and again and again. 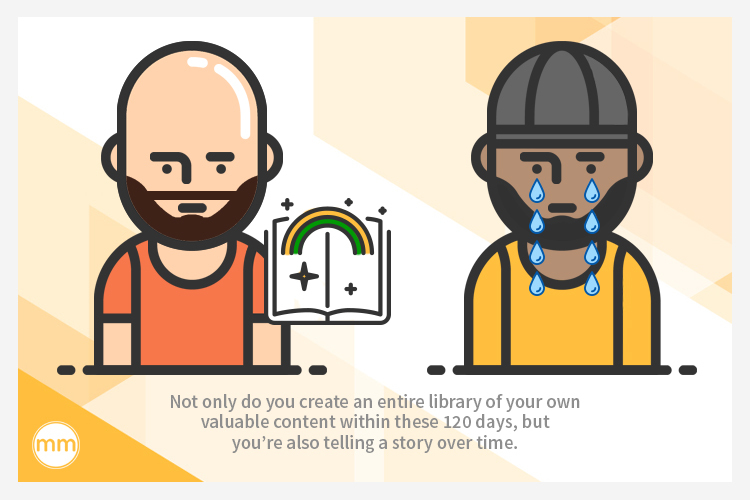 Not only do you create an entire library of your own valuable content within these 120 days, but you’re also telling a story over time. 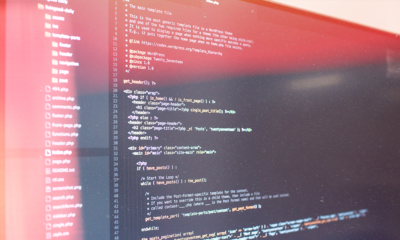 Piecing together all that content will show how you as a brand have remained consistent, and how your perspectives change over time with new information. If you look at the landscape of my content marketing over the past three years or so, I haven’t changed my story. I haven’t changed my views on social media, content, email marketing, marketing automation, or new tools that are coming out. All of my approaches remain the same. The only thing that’s different now is that I talk about these topics in light of new experiences and new value I can bring to the table. If you go back to DPA TV when I used to record in a minivan (lol), I talked about the same stuff that I talk about now, but I spoke within the context of the experiences I was having at the time. It was relevant to me and those small audiences I had at the time. Now I talk about those topics in the context of who I am now, the team members I have now, and the clients I have now. My philosophies have not changed, only the context in which I present them have changed. Remaining consistent with your values while showing the change and growth that happens over time is key to providing truly valuable content. It shows you’re human, but you are committed to providing value. You have to have that same kind of awareness. You have to realize that your content is a piece of you. It’s literally a covenant to pouring out the value you have to offer. 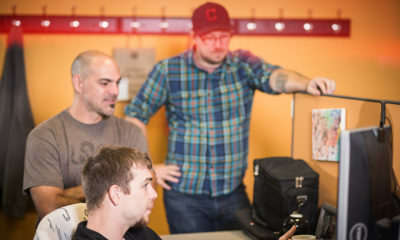 It’s a commitment to create for 120 days, atomize that content, and distribute. But how do you actually bring in leads? 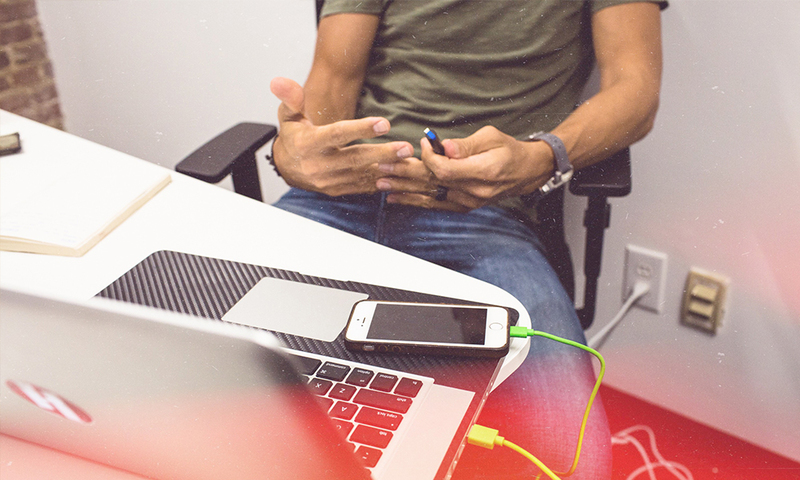 Isn’t the whole point of inbound marketing to bring qualified leads into your brand so you don’t have to spend on traditional or outbound marketing? Yes, that’s true. 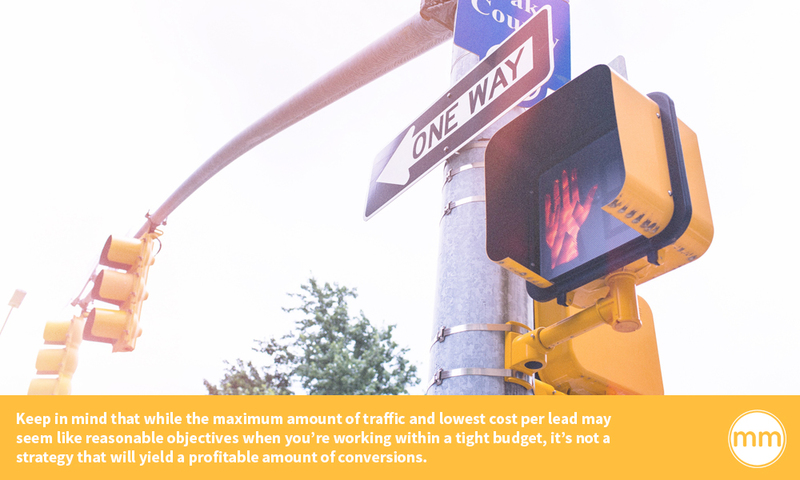 But this is where it gets tricky, because a lot of you know that inbound marketing is about exchanging lead information for value. It’s about that lead magnet. You know you have to put value out there in the form of content— be it a white paper, ebook, video series, or what have you— and you collect information. But many of you know this and either don’t do it or don’t do it right. 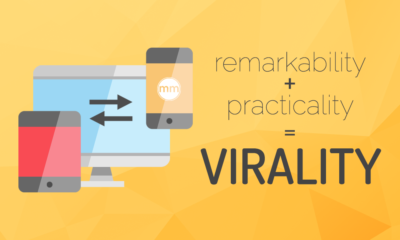 Chances are, if I were to audit your lead magnet, it’s probably not as valuable as you think. Because if it was, then why aren’t people buying into it? Maybe your version of a lead getting excited is not as excited as you initially thought. 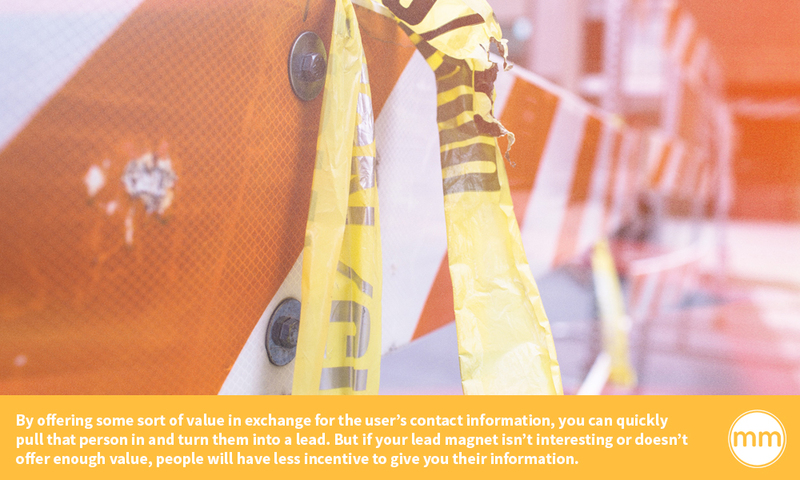 Your lead magnets have to provide value. 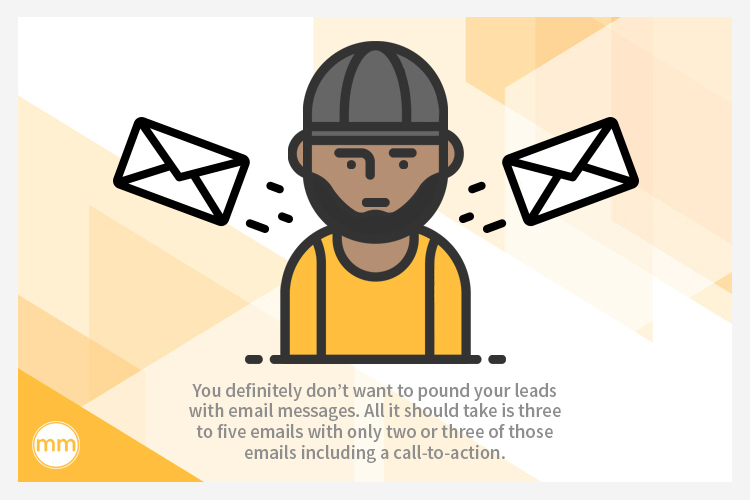 What I mean is that when you have a lead magnet that works, you have some content that a customer is going to say, “yes, please take my name and email amongst the hundred other people I’m subscribing to in 2017 so I can have your content.” And you better believe you have one shot to prove yourself. 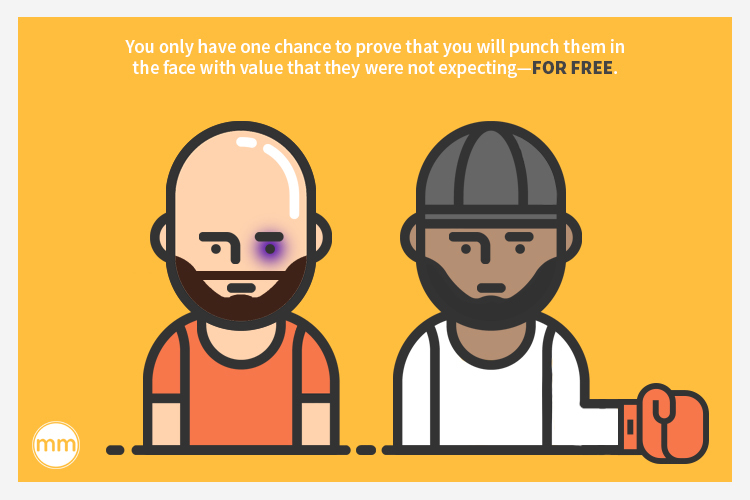 You only have one chance to prove that you will punch them in the face with value that they were not expecting— for free. 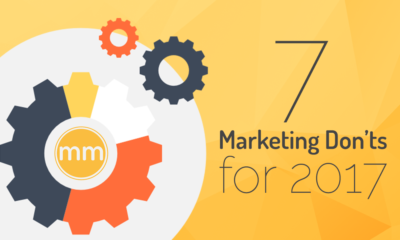 The people who read The Modern Marketer blog are here because I don’t hold back any value. You have my best information. Period. But if you’re a client or a club member, it’s a totally different experience. That’s not to say we’re providing any more value to those who are paying us, it’s that they get the in-depth context of how this applies to their businesses. They get the one-on-one conversations and consultations, the tried and true strategies, templates, and access to my team. People are attracted to your best content, but what they pay for is the context. They pay for the experience and the relevance it has in their lives. 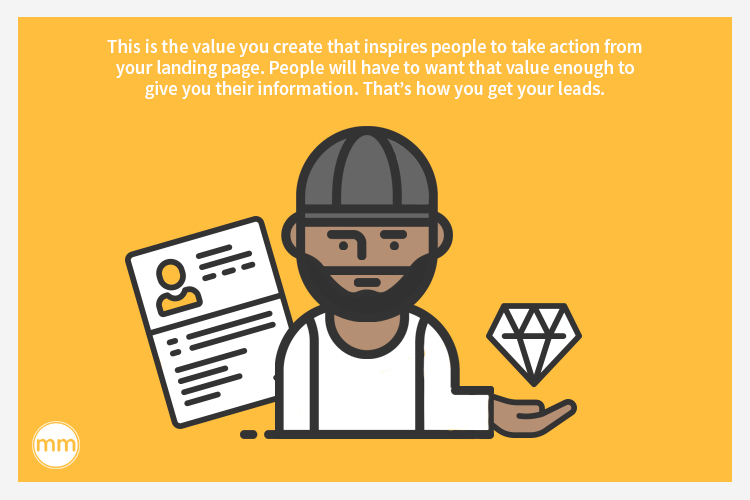 Now if you apply that same concept to your products or service you will suddenly realize that you don’t have to hold any value back in your content or try to leverage that value for a lead’s information. You can just give away your value and information for free. Because at the end of the day, those people come into your ecosystem. You’ll have larger networks and more nurtured people who are ready to buy once you have those conversations that bridge the gap. Those relationships you create with your value are what sell. One last thing— it would be foolish not to mention to you that your content creation strategy must include video. If you’re still only writing textual content in 2017, you’re losing. 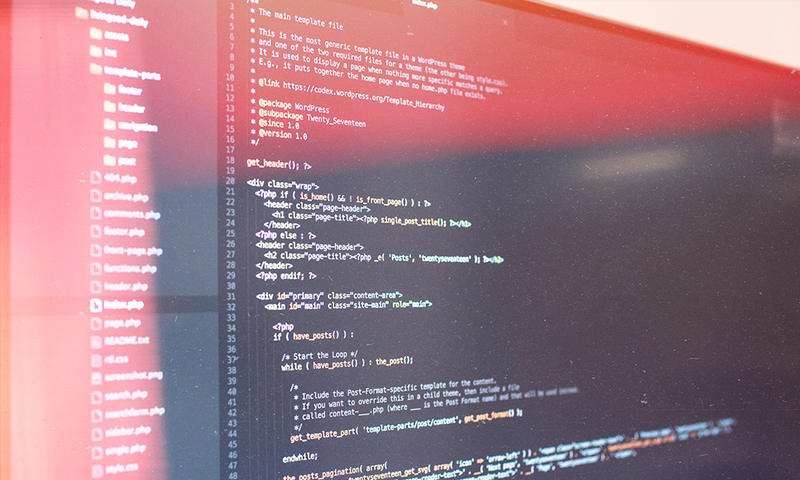 You have to have interactive media being published, distributed, atomized, broken down, repurposed, and upcycled every single day if you’re going to have real chance at breaking into your industry. Like I said before, every industry is saturated. But if you look at every major social media platform, video is being integrated more and more because that’s the direction media is heading. If you’re going to keep up with the market at the very least, make sure you use video. Humans process visuals much quicker than text. Consider that when you’re creating content. Think interactive. Don’t hold back any value. You really can give away all your value for free because what you’re really doing is building a foundation. You’re building a digital curation, your assets, your documented value in story form. 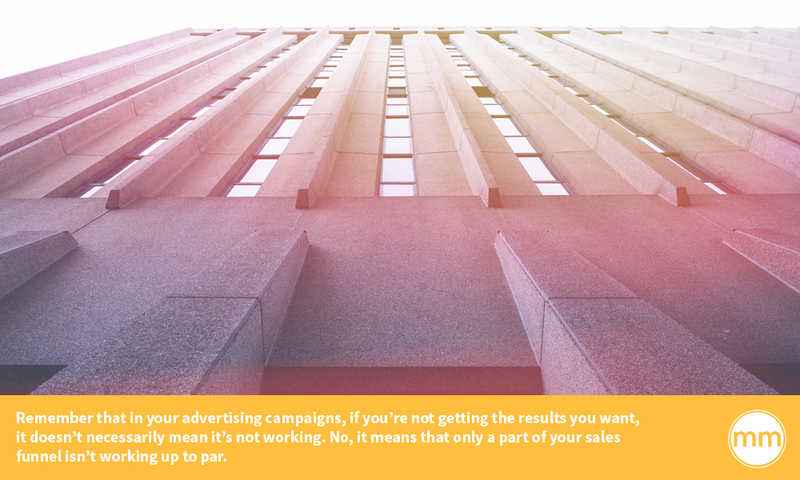 And this is what will get attention, develop community and relationships, and ultimately, qualified leads. Providing true value consistently over 120 days is a commitment but it builds an amazing foundation for your business. You need that foundation in order to sell. Your content is what sells for you. If you can distribute that content in a way that makes sense, definitely including video, you will be on the path to success.